Tag Line: "This Spring, the Stars Will at Last Be Right"
Based on the H.P. 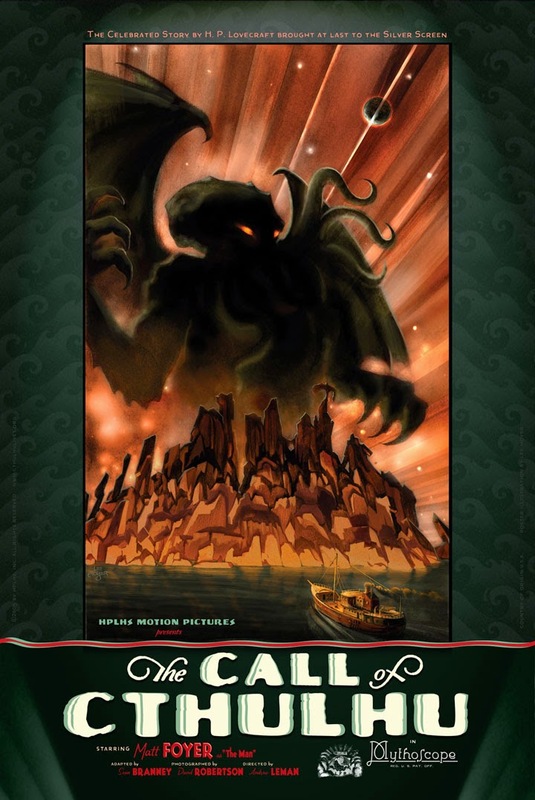 Lovecraft story of the same name, The Call of Cthulhu is an oddity in that, despite being produced in 2005, it’s a black and white silent film, designed to look as if it was released in the 1920’s. Aside from making the movie something of a novelty, this approach also proved the most effective way to relate its unusual story. While browsing through papers that belonged to his recently deceased great-uncle (Ralph Lucas), a man (Matt Foyer), whose name we never learn, becomes obsessed with a strange cult centered on a supposedly mythical creature named Cthulhu. But the deeper he delves into the mystery, the more confused he gets, realizing all the while his attempts to piece it all together might ultimately cost him his sanity. Stylistically, The Call of Cthulhu is an impressive picture, one that successfully captures the look and feel of a silent-era motion picture. Featuring a bombastic score composed by, among others, Chad Fifer and Ben Holbrook, the movie pays homage to such classics as The Cabinet of Dr. Caligari, notably in the scenes dealing with the disturbing nightmares of Henry Wilcox (Chad Fifer), a man interviewed by the lead’s great uncle several years earlier. With their sharp angles and surreal atmosphere, these dream sequences are among the most creative the movie has to offer. Yet as strong as these moments are, it’s the grand finale, in which a group of sailors are attacked by Cthulhu himself, that’ll stay with you. To be honest, I have very little experience with the writings of H.P. Lovecraft. In fact, I’ve never read the short story that The Call of Cthulhu is based on. Being a horror fan, I realize at some point I’ll have to make time to check out the author's work, and if it’s anywhere near as interesting as this movie, I’ve got something to look forward to. Doc, I am definitely going to have to check this one out, it is right up my street. I have no idea how it's passed me by and I'm very grateful to you for bringing it to my attention! I've read a fair bit of Lovecraft and I definitely recommend checking some of his stuff out. Dialogue and character development wise he's somewhat lacking and his prose has a tendency towards stiffness and verbosity but the conceptual scope and imagination of his stories is almost unequalled. My favourite of his is actually "Dagon". It's very short but simultaneously vivid and nightmarish. It also bares little resemblance to the Stuart Gordon film which is actually based on "The Shadow Over Innsmouth" I believe. This is a great picture and a real tribute to both Lovecraft and silent horror. So glad to see another blogger giving it some much deserved attention! This looks and sounds like a must-see! Thanks for the heads up, Dave! This film is absolutely amazing. Everyone who likes horror films and who enjoy Lovecraftian stuff should see it! It borders on brilliance. There's also a very funny making-of addition on the DVD that I watched for this film.